FLATIRON DISTRICT, MANHATTAN: If you’ve lived in New York City long enough, hopefully you’ve experienced this distinctive pleasure: walking around a blind corner only to encounter the face of a long-lost friend. At these moments, the massive metropolis magically shrinks down to a small town. If that early acquaintance just happens to be a 10x-platinum selling rock star, all the more exhilarating, right? Well, that was exactly what happened to Terry Derkach in 2010, a multitasking NYC-based producer/engineer/songwriter two decades removed from his native Winnipeg. On a fateful afternoon stroll through Greenwich Village one day, his path led him directly to his old pal Brad Roberts widely known as one of the most distinctive voices in modern music via his equally distinctive band, Crash Test Dummies. Turns out, Roberts had taken his own circuitous route out of the picturesque capital of Manitoba in Canada settling happily in Harlem to continue his artistic pursuits. Former bandmates in Winnipeg (also the hometown of musical luminaries Neil Young and The Guess Who), the reunited friends were soon collaborating again – on a project of Tantric proportions that neither of them could ever have imagined. Once he settled in NYC, Derkach had been hard at work building up VRTCL Entertainment, a diverse audio practice that now hums busily with composing, sound design, and original music projects from a sun-kissed studio in the Flatiron District. 100 blocks or so uptown, Roberts had been doing some multitasking of his own. 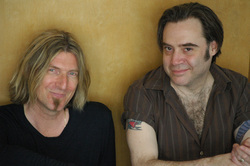 Crash Test Dummies were continuing to record and tour, playing to a dedicated fan base, many of whom had first embraced them with their 1993 international smash “Mmm Mmm Mmm Mmm”, then stayed connected to the band for its nine-album career. Crash Test Dummies’ discography is still in progress, the most recent release being 2010’s Oooh La La!. Meanwhile, Roberts has been nurturing his instantly recognizable bass-baritone voice – and the rest of his body and soul – with a steady regimen of Asana yoga. Along with the repertoire of Asana postures, Roberts became simultaneously engrossed in a Tantric lineage called the Rajanaka, which originally flourished in the 9th Century and was brought back to the West by the scholar and practitioner Dr. Douglas Brooks. Central to Rajanaka, a study of yoga traditions and the cultures of Sanskrit and Tamil literatures, is the reciting of mantras – succinctly defined as a sound, syllable, word, or group of words that is considered capable of creating transformation. “Om” is only the start of the myriad mantras that have emerged over the millennia, and they can serve as extraordinarily powerful tools for those who incorporate them into their lives. Picture the sonically sound logic of Brad Roberts murmuring “Om” into a microphone, and the next step reveals itself: he must record these spiritually satisfying sonics. Determined to produce anything but a New Age record, Roberts and Derkach began creating original song structures around the ancient Rajanaka utterings, invoking influences ranging from Sigur Ros to Massive Attack as their arrangements unfolded. "Rajanaka: Mantra" came together in a very intriguing way. Collaborating at VRTCL they calculated the odd time signatures dictated by the mantras, then used everything from futuristic soft synths to massive drums to underscore Roberts’ incomparable vocal tracks, as the singer recorded hypnotic textures that could go up to 30 overdubs deep. Working together with Roberts for the first time in decades, Derkach was reintroduced not just to the singer’s distinctive voice, but also to his sharp ears for creating arrangements. Roberts would record mantra chants at VRTCL, after which Derkach would add guitar, piano, pads and percussion, then email MP3’s to Roberts uptown for feedback. When the song had taken shape, Roberts would return to VRTCL to record the vocals again plus all necessary overdubs. But getting ancient mantras, meant to be uttered purely a cappela – alone or in groups – to snap neatly into song structures relatable to modern ears required a sonic sleight of hand. Check out track seven, “Invocation”, where the pair deftly make beautiful music out of “lyrics” that repeat, “Om Namah Shivaya Gurave/ Satchidananda Murtaye/ Nishprapanchaya Shantaya/ Niralambaya Tejase” and you get a grasp of the subtle puzzle at hand. Not surprisingly, stock loops were out of the question for Rajanaka: Mantra. Instead, Derkach turned frequently to Spectrasonics’ Omnisphere, Native Instruments’ Battery, and FabFilter to make the record’s transporting arrangements. Untold legions of songwriters enter the music arena, but only a tiny fraction taste the level of success that Roberts has achieved. The attention-grabbing “Superman’s Song” off the Crash Test Dummies’ 1991 album The Ghosts That Haunt Me was his first invitation into the hit circle, while “Mmmm Mmmm Mmmm Mmmm” was a certifiable world smash that launched the Dummies’ 1993 album God Shuffled His Feet – and the band itself – into even more rarefied territory. From those celebrated experiences, and the ongoing journey that’s enabled him to continue releasing records with Crash Test Dummies, Roberts has gleaned the unique lessons that come from bringing hit songs into the world. Ganapati: a star on a different scale. “I learned that a lot of people use music in a huge variety of ways,” he reflects. “I had no idea that people were so affected by the writing that I had done, and I don’t think that I appreciated at the time what was really going on. Because when you sell ten million records, how are you supposed to fathom what sort of memories you’re making in these other people? With Rajanaka: Mantra, then, its fitting that Brad Roberts and Terry Derkach – following a cosmically random convergence — embraced what could be arguably called the greatest hits ever written. Developed, shared, internalized, and depended on by countless generations, mantras span eons and language with their universal utility. This isn’t the first time these truly timeless communications have been set to music, but it’s safe to say they’ve never sounded like this before. Special thanks to TuneFund for helping to make this article happen.